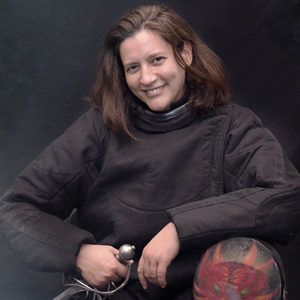 Cheryl Jameson is Co-Curriculum Director and Instructor for the Italian Rapier program. Her background in martial arts goes back 20 + years and includes Tae Kwon Do, Kempo, Hapkido, and SCA Rattan fighting as well as historical rapier studies. She has been fencing for 8 years. She regularly attends many tournaments and workshops including the Decatur School of Arms Rapier and Saber Pedagogy program. She is an advocate for the study of historical systems of martial arts in general. While she has some exposure to I33, German Longsword, and Saber, the primary focus is Italian Rapier, specifically the Venetian School. Her approach to training is more holistic in the sense that good Martial Arts crosses weapons forms. Fighting is fighting. The key to good fighting is building good athletic habits so that when we need the skills in combat we no longer have to think about it.